Stonehenge was, surely, built to look impressive and inspiring, thousands of years ago. 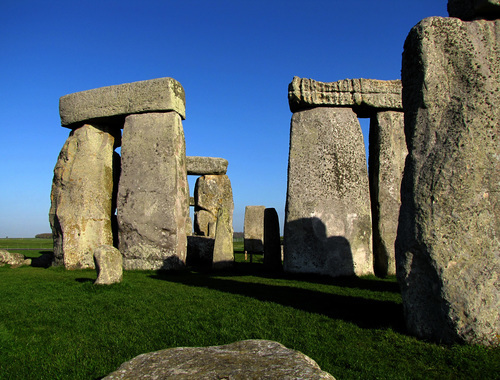 In what ways has an aspect of British culture been influenced by Stonehenge? 1740 was an important year for Stonehenge, as far as its influence on British culture is concerned, for it is the year John Wood, the Elder, surveyed Stonehenge, as well as the year that William Stuckeley’s perhaps more fanciful account and interpretation of the monument appeared. Whether one would say these visits actually influenced British culture as a whole, or have provided inspiration and fuel for individual pieces or series of work, and minority cultures within Britain is a subject for debate. .
For example, John Wood the elder, designed the Circus in Bath with influences both from Stonehenge and from the Palladian styles of architecture, Palladian being a European style based on classical architecture. His design for the Circus refers to the circular layout of Stonehenge, and the use of the acorn in decoration is a reference to paganism which he believed to be the culture that had been in use by the population and the reason for the building of the monument. The diameter of the Circus is the same as that of Stonehenge and it consists of 30 houses, where Stonehenge has 30 of the larger Sarsen stones. John Wood the Elder died before having completed the Circus, though he had already been responsible for Queens Square, Gay street and many other buildings in Bath and elsewhere. His son, John Wood the Younger, continued his work, seeing the Circus to completion. He went on to build the Royal Crescent in a similar style. Some say that the key shame formed by the combination of the Circus, Gay Street and Queen’s Square represent a key which is the symbol of Freemasonry, which both father and son were thought to be a part of. Others believe that the Circus represents the Sun and the Royal Crescent the moon, with Brock Street, joining the two, following an old Ley Line. It is certain that around this time, Stonehenge and the myths and legends connected with it, seemed to entire the nation’s consciousness, though whether it was Stonehenge or Palladian architecture that had the greater influence on architecture is, I would suggest, hardly a question, as Palladian styled buildings, particularly stately homes and public buildings, can be found all over Britain. However, in a more mystical, unexplained way, it is still Stonehenge’s massive, mysterious structure that draws thousands of visitors to it every year.